The Halifax Cycling Coalition is asking you to voice your opinion on the state of Halifax’s street and sidewalk plowing, and support our call for better snow-clearing equipment. It is clear that the city lacks the tools and resources needed to keep people moving in the winter months, particularly for people who are walking or biking. 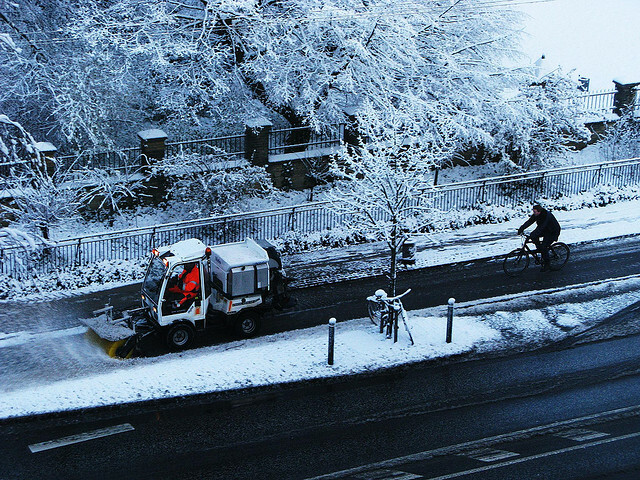 In other snowy cities a brush machine is used to clean sidewalks and bike lanes down to bare pavement. The Halifax Cycling Coalition believes that Halifax should invest is this sort of equipment to maintain access for people who walk, use bikes, and use accessibility equipment such as wheelchairs and walkers. Our petition calls for the city to review snow-clearing practices to ensure that sidewalks, curb cuts, storm drains, pedestrian islands, bike lanes, transit stops and all other public infrastructure is cleared in a way that respects the needs of all road users. These brushes can be installed on the existing fleet of plows. Last week, councillors rejected an opportunity to review sidewalk clearing practices. Seven councillors think our sidewalk clearing is so great that we shouldn’t even discuss the matter. At the same time a fed-up wheelchair user took it upon himself to clear the path in front of his home. He was trapped inside his apartment thanks to the city’s inadequate snow removal. Anyone who has walked or biked in the last two weeks knows something has to change. On Friday, hundreds of Haligonians will gather to protest the awful sidewalk clearing on the Peninsula. Please sign the petition below. It will send a message to council that proper snow clearing equipment matters for people who walk and ride bikes. Halifax stands on its own in terms of sidewalk plowing. We should demand the same quality of service as is provided in New York, Ottawa, Toronto, Montreal, and other North American cities. By refusing to allow staff to study the issue council is keeping us in the dark about the cost of providing proper service to residents. Let’s work together to ensure Halifax’s snow plowing is as effective as possible. The purpose of this petition is to ask city council to review Halifax's sidewalk and bike lane clearing practices. Halifax's sidewalks are in awful shape and a review is needed. Other cities, and some local private groups such as Dalhousie University, use bobcats equipped with brushes to clear sidewalks to bare pavement. On February 17th council rejected a motion to review the city's sidewalk clearing saying that it's not an issue that matters. We think it matters. Ask council to review our sidewalk clearing practices and find a way to make it work better for people who walk, use a wheelchair, or ride bicycles. 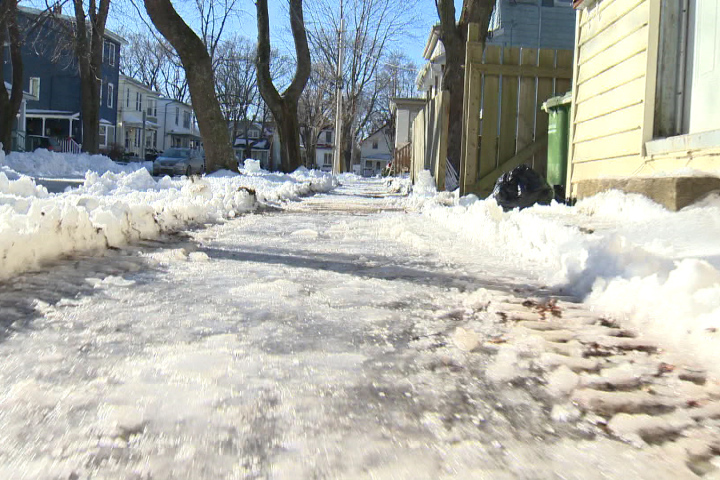 Halifax Council will direct staff to explore the use of mechanical brushes, gravel, sand, and manual labour to ensure sidewalks can be cleared to bare pavement under the existing service standards. The staff review will include all infrastructure in the right-of-way including, but not limited to, bike lanes, curb cuts, pedestrian islands, transit stops/shelters, storm drains, and fire hydrants. Council will ensure that the sidewalks are cleared to bare pavement in 2016, in a manner that respects the needs of all road users..
Council should order the staff report immediately so that adjustments to the service can be made in time for November 2015. The Halifax Cycling Coalition is a volunteer-run organization working to make cycling the leading transportation option in Halifax.